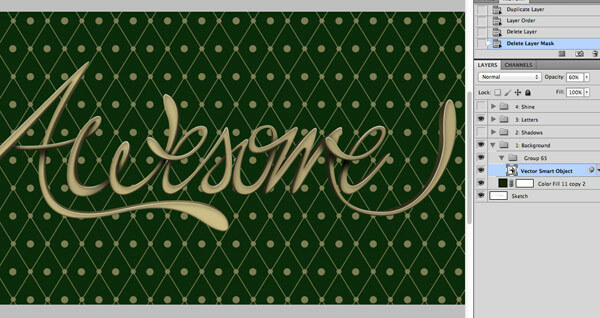 In this tutorial we will explain how to create “awesome” 3D-style typography using illustrative techniques in Photoshop. 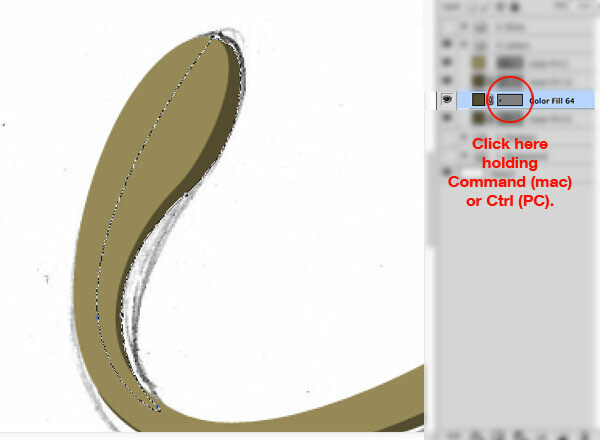 This tutorial does not utilize any 3D apps or tools and relies heavily on a good sketch, as well as your ability to apply proper light and shadow. Want a faster solution? 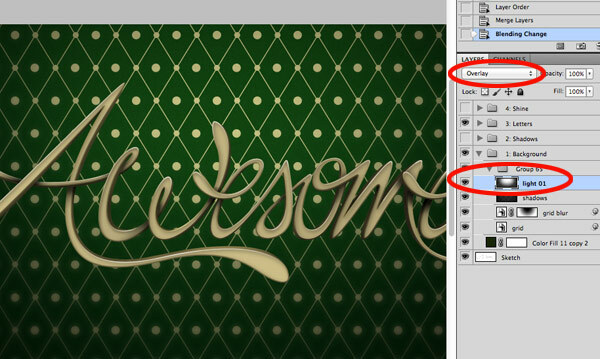 Browse the amazing selection of Photoshop Layer Styles on GraphicRiver to create amazing text effects in half the time! 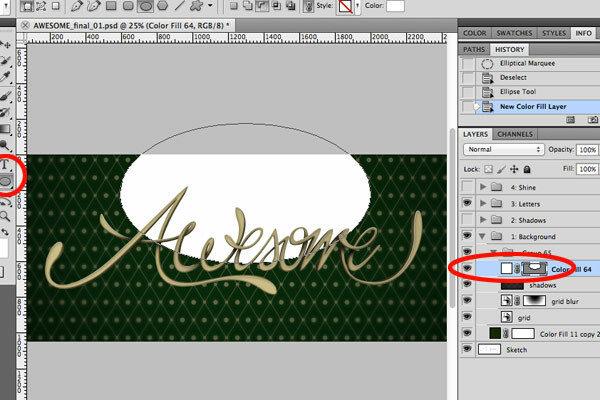 Or enlist the help of a design professional from ThemeKeeper Studio for all your custom typography needs. In the first case (side view), only the parts in red are visible. The same applies to the second case (top view). 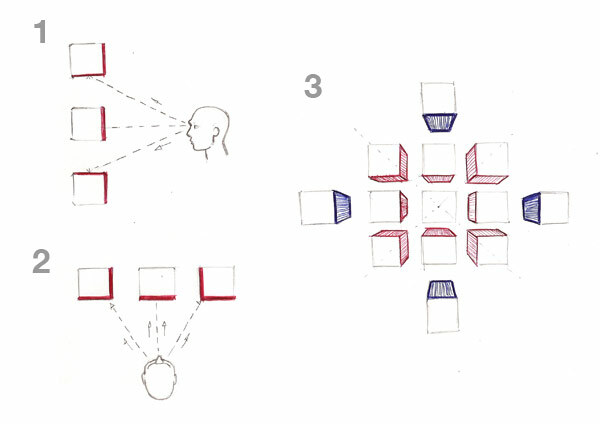 In the third case, there’s a mix of the first and second case—the farther we are away, the more perspective there is. 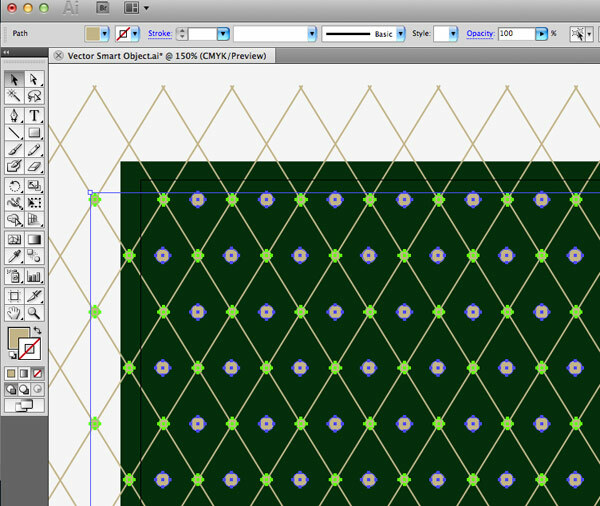 In this case, the sides are highlighted in blue. 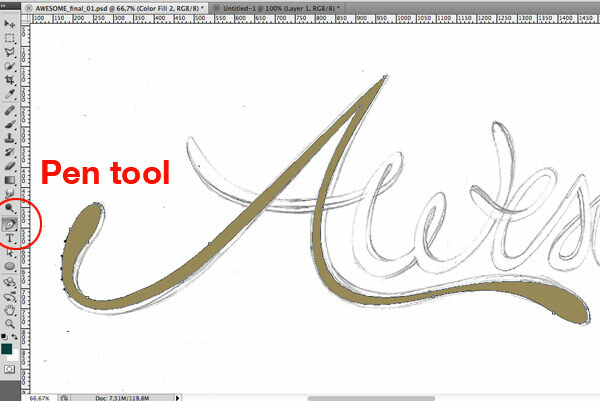 Using the Pen Tool, start to draw the letters (inside the folder “3: letters”), following the same path of the sketch. Use #978958 to fill the letters with this color. Do the same on all letters. 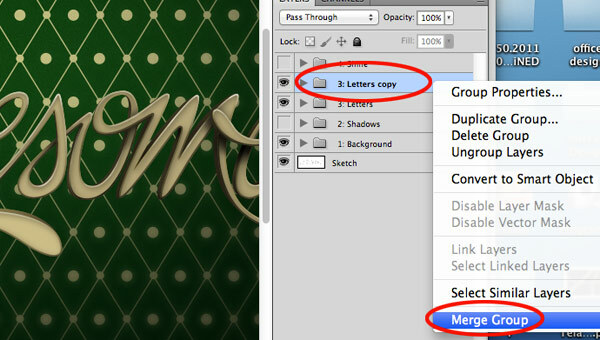 Each letter should be on a separate layer inside the folder “3: Letters”. Now let’s make the paths to create depth. 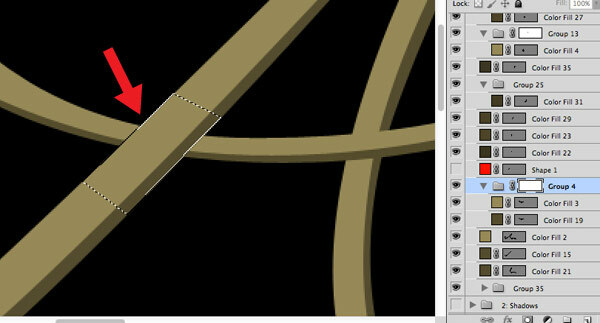 Refer to the first step where I explained the differences in perspective. 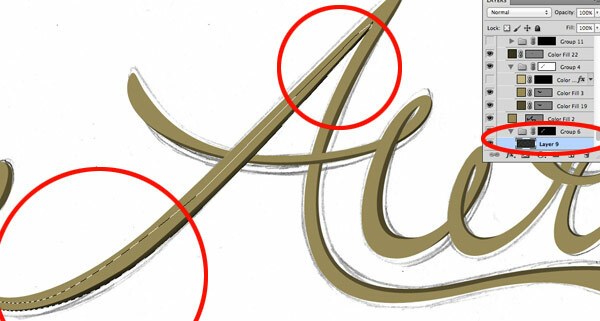 To give a sense of depth, just follow along the paths from the sketch. 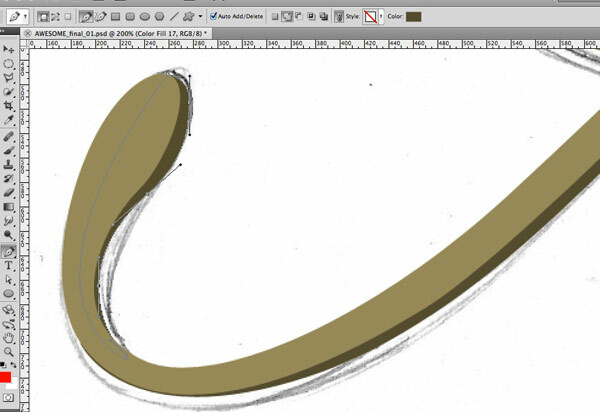 Many times we can correct the paths of the sketch when we are drawing in Photoshop by making more rounded curves. Use the color #554c2f. 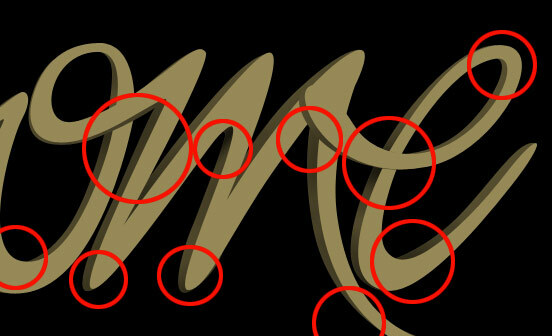 Sometimes you’ll see that some parts are overlapping other parts. 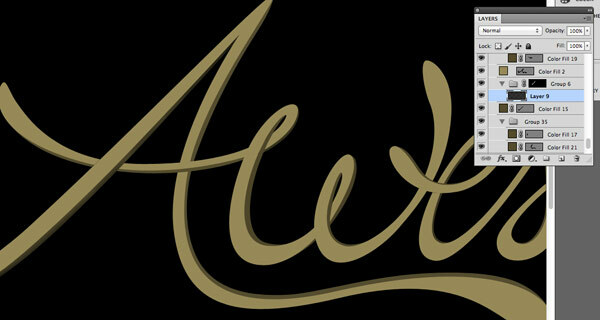 See the example below, the letter “A” where the two legs are going over. 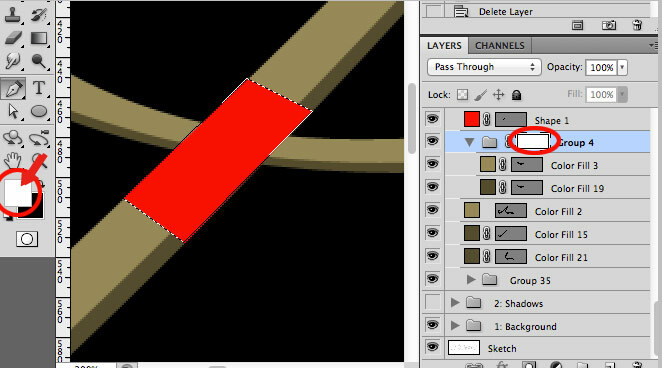 To make one of the lines pass underneath, we do not need to change the position of the layer; instead, we need to make a folder called Mask to hide the piece of the line that overlaps the other object. 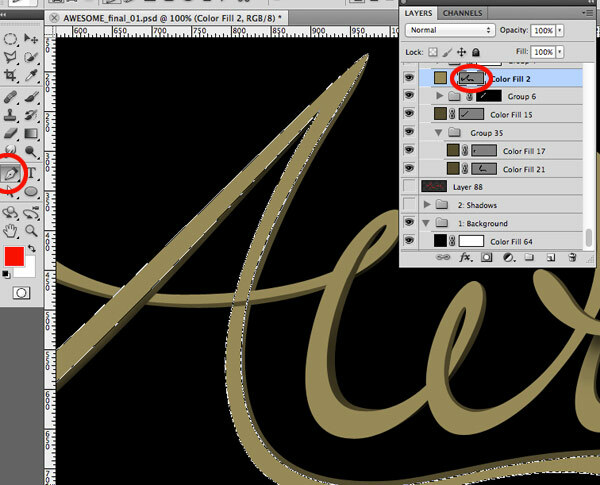 To do this, group both layers of the object that are overlapping the line (crossbar) of the “A” as seen in the image below. 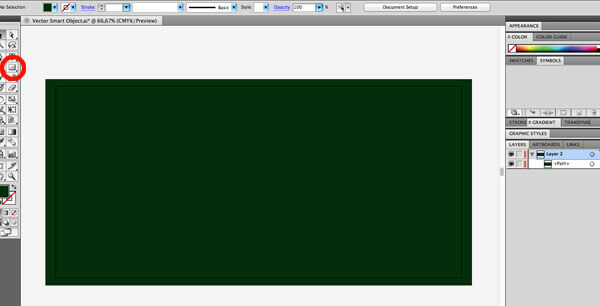 Upon completing those steps, we will now create a Layer Mask on this folder. 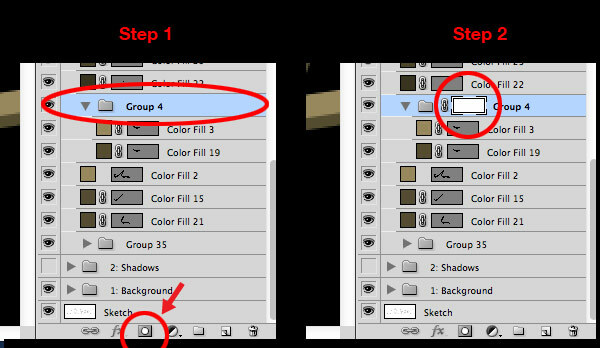 Click on the ‘group’ layer and then, on the bottom Layers panel, click on the Icon that is shown in step 1 (see below). 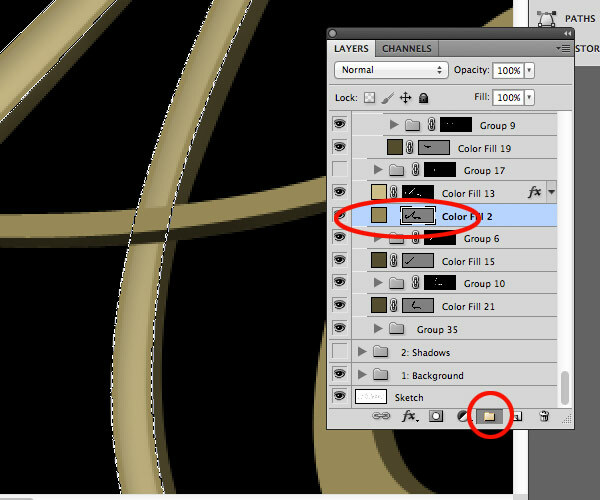 The result is a white rectangle on the right side of the folder which is called a layer mask (step 2). 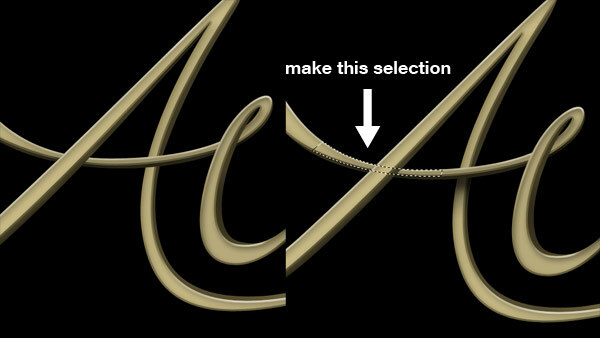 The next step is to draw an object exactly on the paths of the line on letter “A”, as seen in the image below. 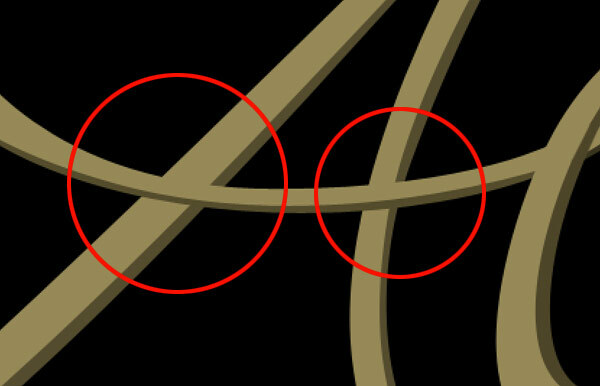 You will see that one of the lines from the crossbar of the “A” now passes above, and the other line goes below. 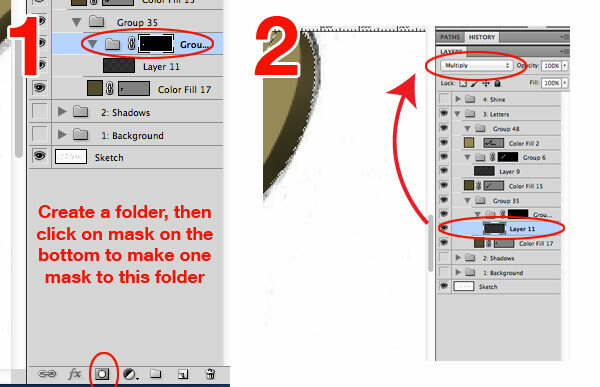 Don’t forget to Delete the temporary layer that was created to create the mask. 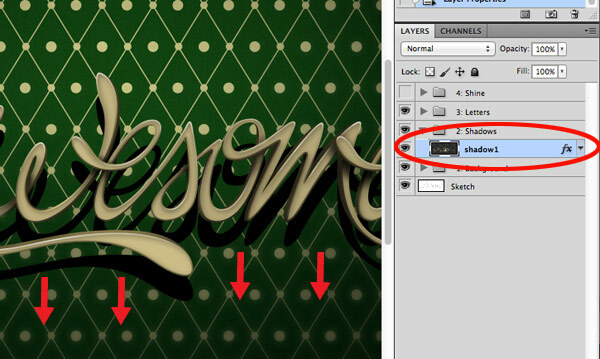 Do the same on all letters that are overlapping. 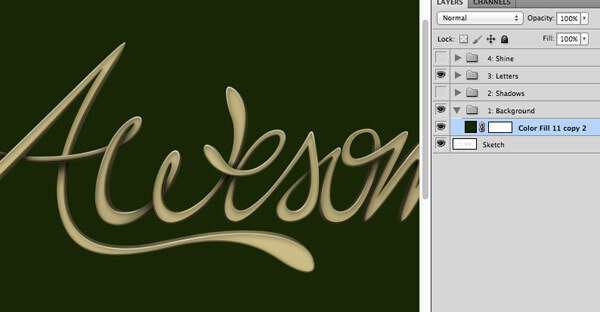 Now we will create a border effect on the letters. 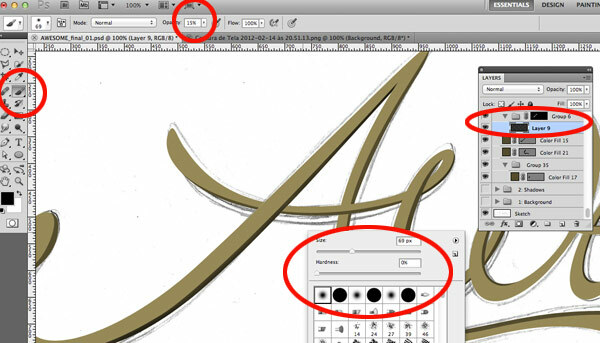 Select the Pen Tooland, holding Command, click on the path of the letter “A”. 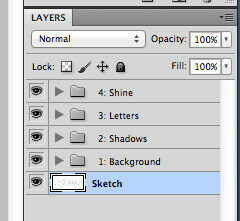 Now go to the layer panel and again, holding Command,click within the grey part on the layer of the path. 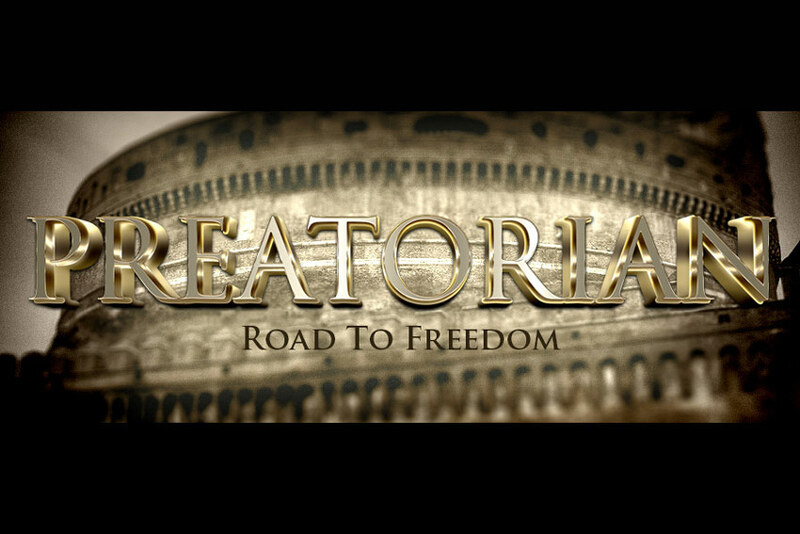 You will make a Selection on this path, as seen in the image below. 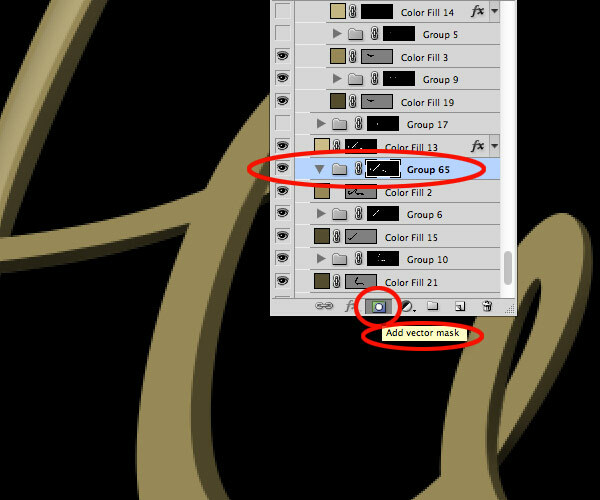 While keeping the selection, go to the bottom of the Layers panel, click on the icon (see image below), and select Solid Color, using#ccbd88 as your color. 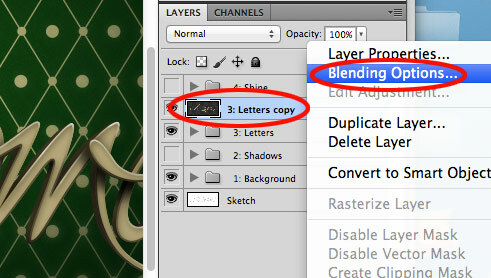 After the previous step, Double-click on the layer to open Blending Options. 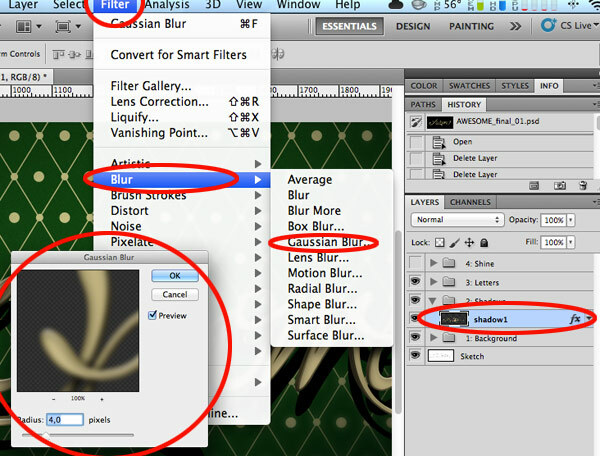 Select Inner Shadow and use 120°for the angle, Opacity 30%, Distance 5, Size 15, and click OK.
With the group layerpreviously selected, click on the Mask icon on the bottom (see image below) to add a mask to this folder.All objects within this folder will be inside the mask. 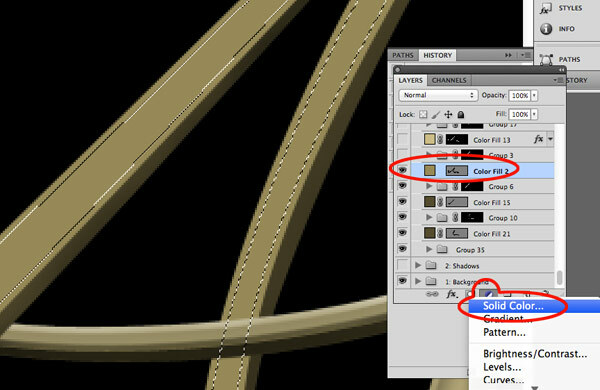 Create two layers inside this folder. One will be used for brightness, the other for the shadows. You must know that the light usually comes from up to down. 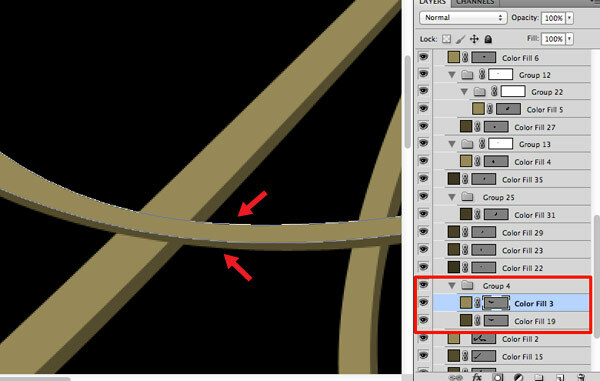 Now you know this, select the brush tool and with the white color and 30% Opacity, carefully paint the ends, as shown in the image below. 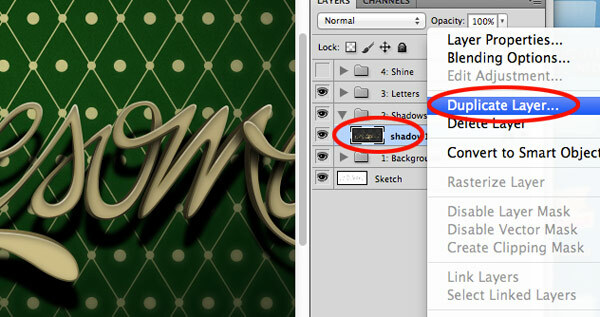 The same must be made to shadows on the “shadow layer”, but using the #000000 (black), with 30% Opacity. 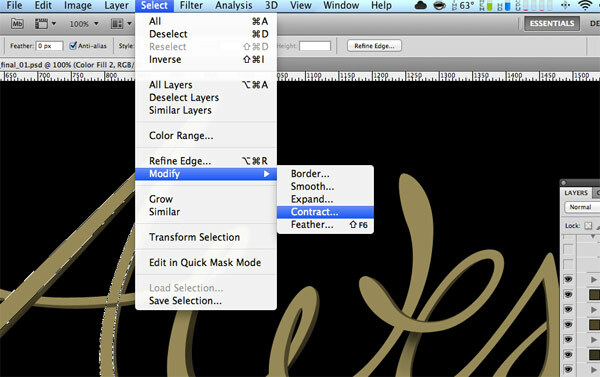 Now, inside this folder with the mask, create a New Layer as Multiply. 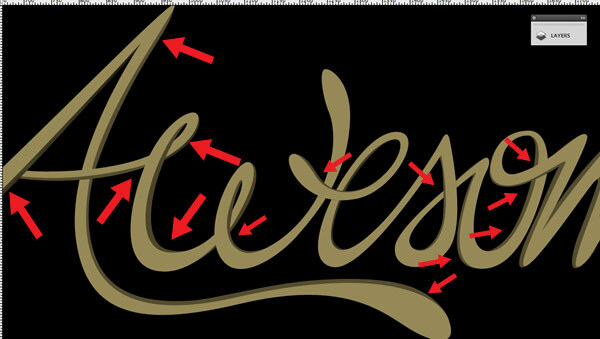 Using the Brush Tool with the color #000000 (black) and 20% Opacity, carefully paint underneath the line (crossbar) of the “A” that is on the first plane. 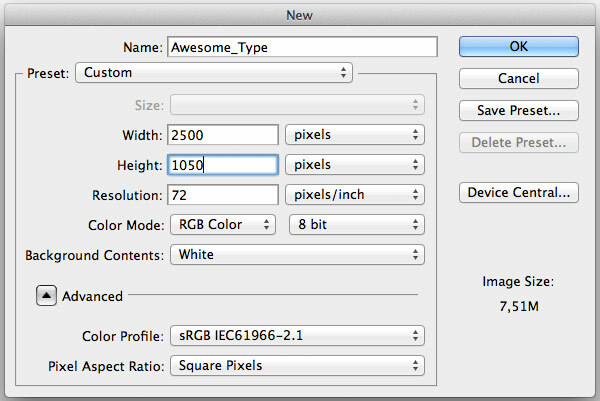 Open Adobe Illustrator and create aNew Document at 2500 x 1050 px. 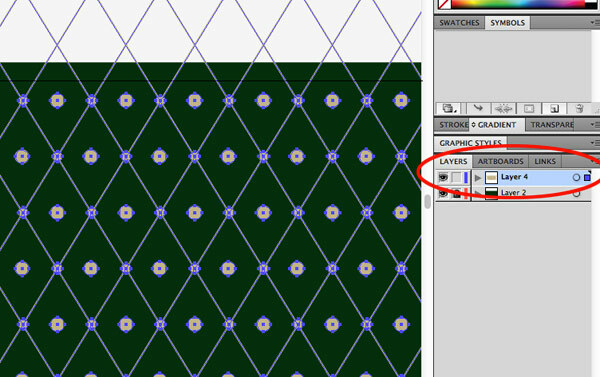 Using the Rectangle Tool (see image below), make a rectangle with the color #192607. 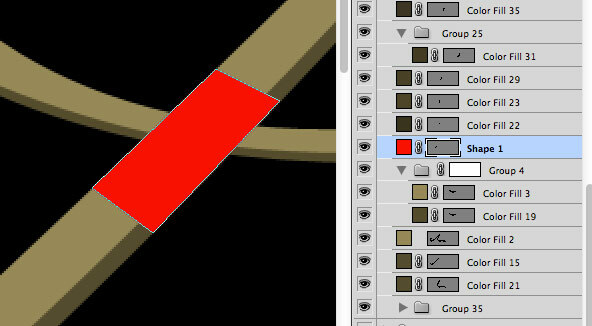 Now, create smaller circles on the intersections and bigger circles on the middle of the line’s junctions. Use the color#C4B488. 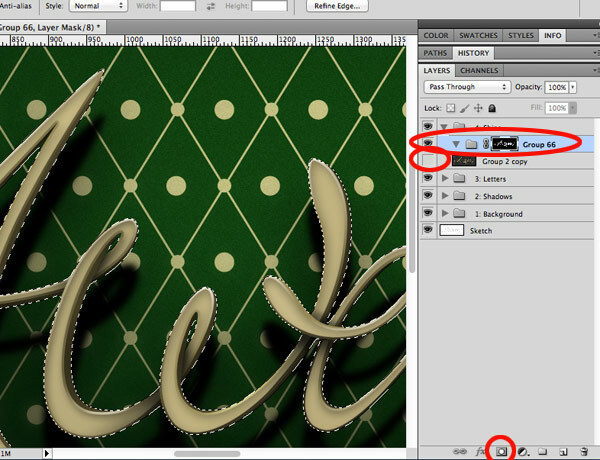 Copy the vectors from Illustrator, and Paste them in Photoshop inside the folder “1: Background” as shown below. 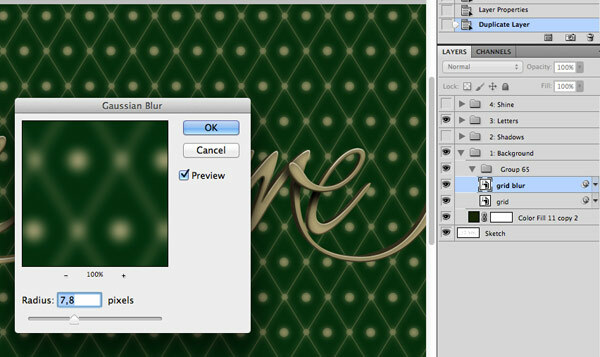 Rename the layer to “Grid”,Duplicate it, and on the layer below, apply “gaussian blur” using 7, 8 as the Radius. 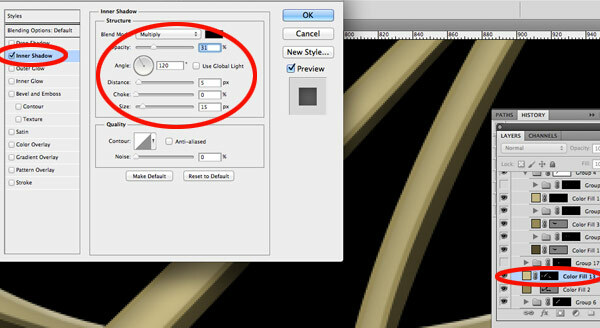 Apply a Mask on this layer that has the “Gaussian blur”, and using Radial Gradient, click on the top center of the image and drag to the right corner, as shown in the image below. It is important that the color #000000 (black) is the main color. 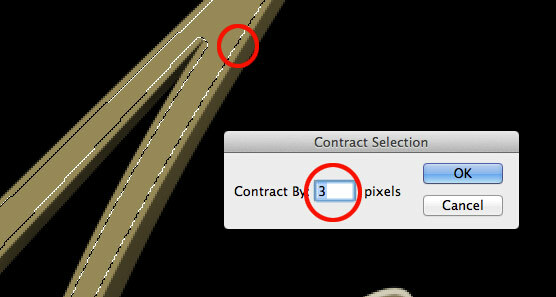 You will notice that only the sides are now blurred, leaving the center sharper. 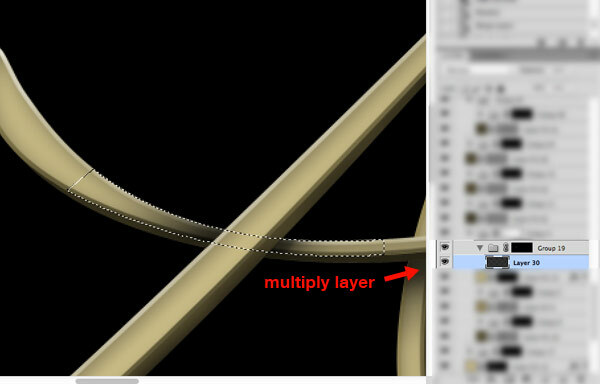 Create aNew Layer and use it as a Multiply layer. 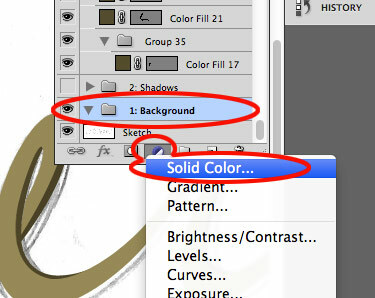 With the tool Radial Gradient and (Reverse) selected, drag from the center to the right, as shown in the image below. 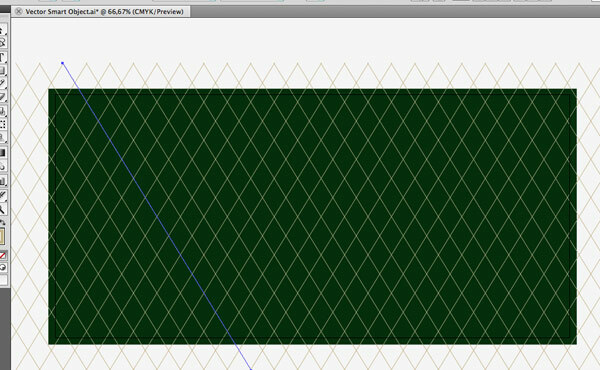 This will hide the blurry part in the center of the image. 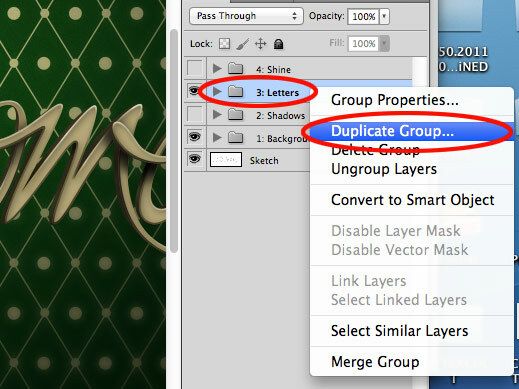 Duplicate the folder “3: Letters”. 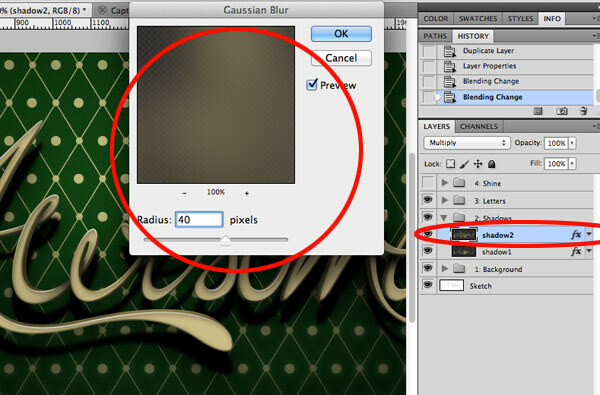 On the layer “shadow1”, go to the top menu Filter > Blur > Gaussian blur and use 4.0 as the Radius. 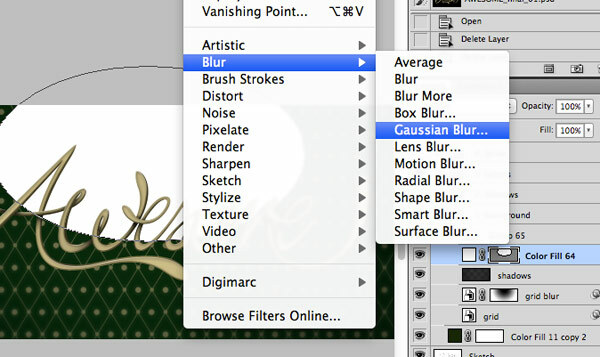 On the layer “shadow2”, go to the top menu Filter > Blur > Gaussian blur and use 40 as the Radius. 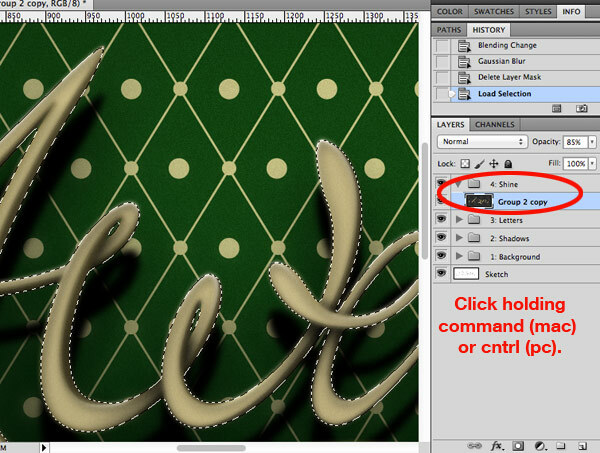 Repeat these steps, and drag to the folder “4: shine”. 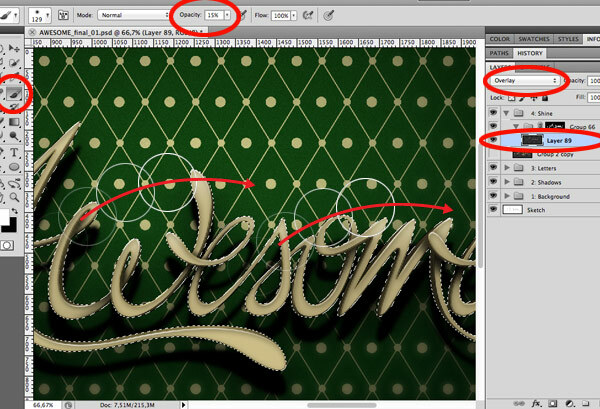 Create a New Layer inside this folder, and use it as Overlay. 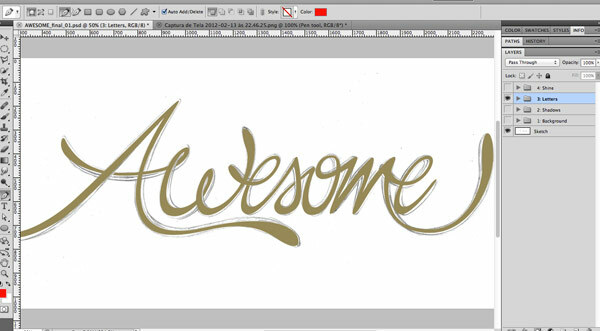 Select theBrush Tool withcolor #ffffff(white), 15% Opacity, and carefully paint the top letters until these letters become clearer.